One of the major advantages of Smartphones is “Photography”. Also Google Playstore offers many photography apps for photo effects. So we don’t need more to turn of computers or download powerful & expensive photo editor apps for photo effects. Now by using just Smartphones we can create striking & incredible image effects. Today, I’m also telling you how to apply amazing photo effects with Pixerist FX photo editor app. Let’s discuss in detail about this smartphone app or android app. Pixerist FX photo editor app is free but Pixerist FX photo editor Pro app is available for $4. This app offers many cool & amazing filters for magical photo effects. 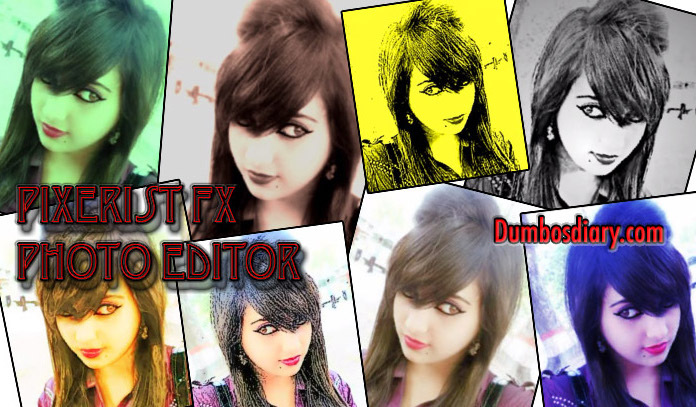 There’re also some frames offered by this image editor. This photo editor also has great photo editing tools that can make photo according to users’ wishes. Vintage 1, Holga 1, Holga 2, Vibrance 1, Vibrance 2, Soft 1, Soft 2, Soft 3, Soft 4, Vintage 2, Vintage 3, Vintage 4, Vintage 5, Noir, Noir 2, Overlay 1, Ice Baby, Auto levels, Caliente, Inverno 1, Inverno 2, Purple, Pop 1, Roy 1, Burn, Andy Hot, Hot 1, Equaliza, Smart Blur, Hot glow, Overlay 2, Chrome 1, Chrome 2, Chrome 3, Chrome 4, Blur 01, Suaviza 1, Suaviza 2, Unsharp 1, Unsharp 2, Unsharp PB1, Unsharp PB2, Overlay 3. Sun 01, Sun 02, Sun 03, Sun 04, Sun 05, Sun 06, Sun 07, Sun 08, Sun 09, Sun 10, Sun 11, Sun 12, Sun 13, Sun 14, Sun 15, Sun 16, Sun 17, Sun 18, Sun 19, Sun 20, Sun 21, Sun 22, Sun 23, Sun 24, Sun 25, Sun 26, Degradee 1, Degradee 2, Degradee 3, Degradee 4, Degradee 5. Retro1 -01, Retro1 -02, Retro1 -03, Retro1 -04, Retro1 -05, Retro1 -06, Retro1 -07, Retro1 -08, Retro1 -09, Retro1 -10, Retro1 -11, Retro1 -12, Retro1 -13, Retro1 -14, Retro1 -15, Retro1 -16, Retro1 -17, Retro1 -18, Retro1 -19, Retro1 -20, Retro1 -21, Retro1 -22, Retro1 -23, Retro1 -24, Retro1 -25, Retro1 -26, Retro1 -27, Retro1 -28, Retro1 -29, Retro1 -30, Retro1 -31, Retro1 -32, Retro1 -33. Retro2 -01, Retro2 -02, Retro2 -03, Retro2 -04, Retro2 -05, Retro2 -06, Retro2 -07, Retro2 -08, Retro2 -09, Retro2 -10, Retro2 -11, Retro2 -12, Retro2 -13, Retro2 -14, Retro2 -15, Retro2 -16, Retro2 -17, Retro2 -18, Retro2 -19, Retro2 -20, Retro2 -21, Retro2 -22, Retro2 -23, Retro2 -24, Retro2 -25, Retro2 -26, Retro2 -27, Retro2 -28, Retro2 -29, Retro2 -30, Retro2 -31, Retro2 -32, Retro2 -33, Retro2 -34, Retro2 -35, Retro2 -36, Retro2 -37, Retro2 -38, Retro2 -39, Retro2 -40, Retro2 -41, Retro2 -42, Retro2 -43, Retro2 -44, Retro2 -45, Retro2 -46, Retro2 -47, Retro2 -48, Retro2 -49, Retro2 -50, Retro2 -51, Retro2 -52, Retro2 -53, Retro2 -54. Black & White, Pop Drawing, Art Outline 1, Art Outline 2, Art Outline 3, Art Outline 4, Art Outline 5, Misty Colors 1, Misty Colors 2, Misty Colors 3, Pop 1, Grain P&B, Grain Sun, Grain Color, Andy Red, Andy Green, Andy Blue, Roy 1, Roy 2, Roy 3, Pop Limit, Grain Pop 1, Grain Pop 2, Grain Pop 3. Surface Blur 1, Surface Blur 2, Beauty 1, Beauty 2, Beauty 3, Beauty 4, Beauty 5, Beauty 6, Beauty 7. Toon 01, Toon 02, Toon 03, Toon 04, Toon 05, Toon 06, Toon 07, Toon 08, Toon 09, Toon 10, Toon 11, Toon 12, Toon 13, Toon 14, Toon 15, Toon 16, Toon 17, Toon 18, Toon 19, Toon 20, Toon 21, Toon 22, Toon 23, Toon 24. Niepce 1, Niepce 2, Slide Antigo, Antiga 1, Antiga 2, Antiga 3, Daguerre, Malta, Ferrez. Tint 01, Tint 02, Tint 03, Tint 04, Tint 05, Tint 06, Tint 07, Tint 08. Blur 1, Blur 2, Blur 3, Blur 4, Blur 5, Blur 6. There are also more filters available, free as well as paid for photo effects with Pixerist FX photo editor app. This Picture editor app offers 17 different types of frames to make photos stunning. For photo effects with Pixerist FX photo editor app try frames from Moldura 1 to Moldura 17.